The huge numbers of patients with complex and serious gunshot wounds are overwhelming the healthcare system in Gaza, leaving thousands in danger of infection and disability. A slow-motion healthcare emergency is unfolding in Gaza as the cumulative needs of patients shot by the Israeli army and seriously injured during protests mount. The vast majority of the 3117 patients treated by MSF in the period from 30th March until 31st October – out of the total 5866 the Ministry of Health say have been injured by live fire – have been shot in the legs, leading to around half suffering open fractures, with severe soft tissue damage to many of the rest. These are complex and serious injuries that do not quickly heal. Their severity, and the lack of appropriate treatment in Gaza’s crippled health system, means that infection is a high risk, especially for patients with open fractures. Gaza currently lacks the ability to properly diagnose bone infections, but from experience MSF expects that at least 25% of patients with fractures are infected. Out of roughly 3000 open fractures, this means that it is likely that more than 1000 patients are infected. Based on a preliminary analysis of MSF’s patients in Gaza, we estimate that at least 60% of the total number of the injured treated by all health providers – a massive 3520 people – will need further surgery, physiotherapy and rehabilitation. In addition, a significant proportion of those patients will require some form of reconstructive surgery to properly heal, but untreated infections will prevent that from happening. This burden is too much to bear for the health system in Gaza in its current form, weakened as it is by more than a decade of blockade. Such a large number of injuries affects not just those injured, but also strains the provision of regular healthcare in Gaza. The consequences of these wounds – especially if untreated – will be lifelong disability for many, and if infections are not tackled then the results could be amputation or even death. Although MSF and other organisations are working hard to provide treatment for these patients, the scale of the needs is quickly becoming overwhelming, challenging our continued ability to respond. The situation is also worsening as more people are shot, wounded flesh and bone dies, and as the risk of infection increases. An adequate response will cost tens of millions of Euros – money that urgently needs to be found. “What is required now is for the Israeli and Palestinian authorities to do all they can to facilitate the free access and work of all healthcare providers in Gaza that are trying to build the advanced capacity to care for these people; for other countries in the region and around the globe to step forward and offer funding and space in their hospitals where advanced surgical capacity exists; and for authorities in Palestine and Israel to facilitate the transfer of these patients abroad,” said Ingres. 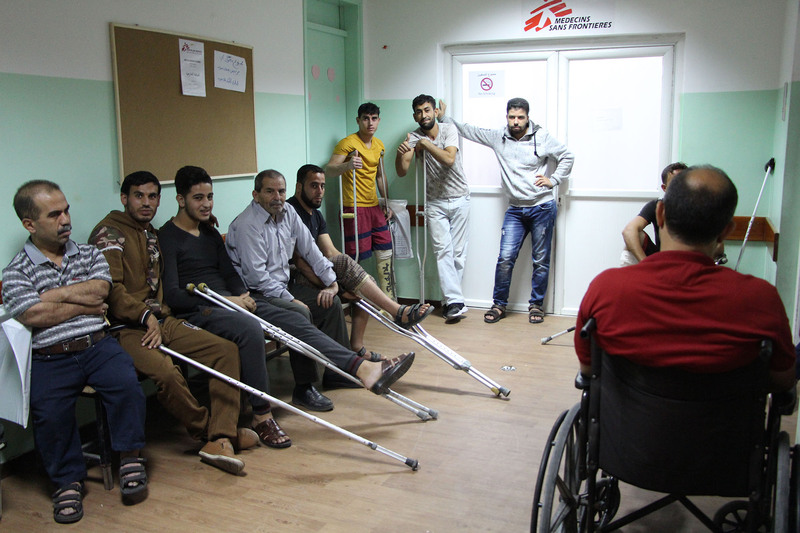 MSF has over 260 personnel working across four hospitals and five post-operative clinics in Gaza, providing dressing changes, physiotherapy, and doing plastic and orthopedic surgery.